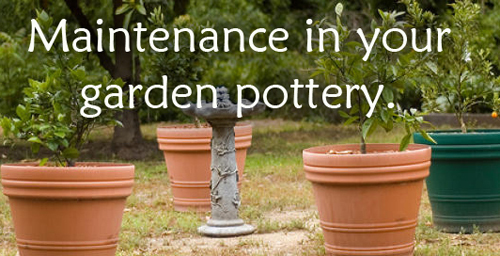 Maintenance in your garden planters. What to do to your garden pottery affects the larger landscape around you. Read these few tips and let us know. 1. Are you composting all the green and brown waste your garden pottery produces? Fallen leaves, weeds without seeds, grass clippings, spent flowers, and vegetables. You need to dead head all potted plant materials and clean up any leaves that are sitting on or around your garden planters. 2. Do you use natural fertilizers such as aged chicken manure or liquid fish emulsions to feed your veggies or potted annuals? These all help the environment and are easy to use. 3. Do you mulch or use materials to top your planted garden pots? This helps to keep surface weeds from growing and helps considerably to conserve water? We sell faux rocks that serve this purpose and are decorative and lovely. 4. Do you water your potted plants efficiently so there is not a lot of runoff and waste? Do it slowly, deeply and infrequently, always in early morning or evening and never on windy days. We also sell the olla bottles that you plant in the pot that doesn't this for you easily and without any waste at all. Check them out here. These are just a few tips that we think are helpful. Let us know what you think. Read more.....Dreaming of spring color?